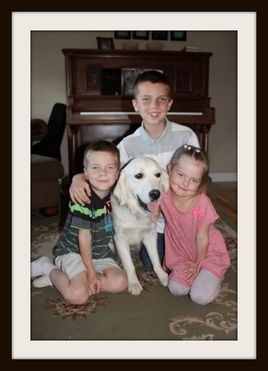 We are a family operated hobby breeder of the beautiful English Cream Golden Retriever. Doug and I (Judy) are happily married and blessed with 8 beautiful children (yes they are all ours!). We are passionate about what we do here at Oregon Mist Goldens and believe that our dogs AND our clients deserve the very best! As a result, our dogs live either in the home with us or with one of our exceptional Pick of the Litter Families! Our reason for choosing the English Cream Retrievers is because we love the breed, it's smartness, love of people and children, and it's exquisite beauty. The English Cream Golden is one breed where you can "have it all" in one dog!!! 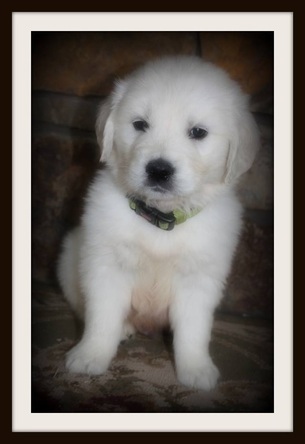 We pride ourselves in being one of the finest English Cream Golden Retriever breeders in Oregon. We also guarantee to provide you with a most beautiful and superior English Cream pup topped with the best service and care for the life of your Oregon Mist family member! Our family ~ all 10 of us! In 2011 we were blessed with 3 wonderful English Cream Golden retrievers: Troy, Miss Keisha and Miss Ember ~ gorgeous English Creams with amazing champion pedigree. As our passion is to continually improve our breeding program so that we offer only the very best, in 2013 we were able to add to our Montana Mist family 2 very wonderful females which we imported from Russia ~ Miss Izya and Miss Hanna! These girls had both won their championships in Russia and came to us each expecting a beautiful litter of champion bred puppies! From beautiful Miss Izya we also have her gorgeous daughter Miss Sophie! And our newest addition, Miss Elsa is a daughter of beautiful Miss Hanna. Along with making sure our pedigree is of the healthiest lines we could find, all of our sires and dams have their hip, elbow, heart and eye clearances so that we can ensure we are producing the healthiest, top quality pups possible! And so our program has continued to improve with top quality pedigree, show quality looks and build and most importantly, amazing temperament and health! Not only was the quality of dogs we choose to breed important to us, but how our dogs are treated was of top priority to us! We consulted with many other top breeders and were very impressed with those who chose not to keep their dogs in kennels, but rather allow them to live happy, full lives in a loving home just as every dog should experience and be allowed to live! Thus came in to being our popular Pick of the Litter program! This program has been amazing blessing to us, our dogs and our wonderful Pick of the Litter families. Click here to read more about our Pick of the Litter Program. Click here to learn more about our amazing Pick of the Litter families. 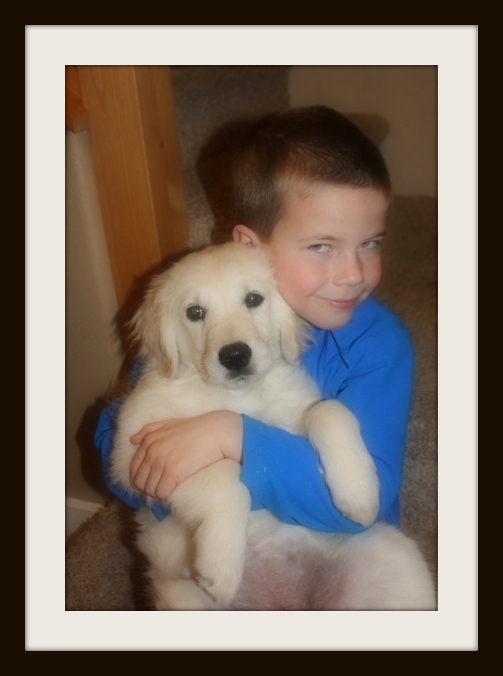 How we raise our puppies is of equal importance to us! Our puppies are raised in our homes, and since socialization is a crucial development to puppies, we start from day one including these prized pups into our lives until they they become a part of yours! We provide top quality nutrition and vet care to our puppies and each of our puppies come to you with a vet certificate and clean bill of health! We have an amazing Lifetime Free Puppy Replacement health guarantee that you will not find offered with any other breeders and we have set this guarantee in place for the benefit and blessing for our wonderful Montana Mist parents! We have lived in Montana all our lives and raised our family in the heart of the Rocky Mountains in a beautiful home on 5 acres. As our family has grown and matured, so have my husband and I! One thing we have learned in life is to "never say never"! We never thought we would ever move and thought the beautiful Treasure State would always be our home! However, in 2015, with 5 out of our 8 children becoming teenagers it became very apparent their needs superseded ours! Our family values are such that we want to provide optimum environment for our children's lives, success and future! 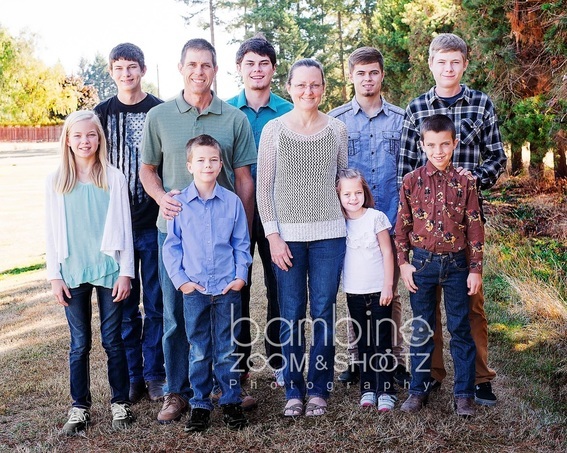 Since God is first in our lives and we wish that for our children as well, in August 2015 we chose to move our entire family to Keizer, Oregon where they could be closer to our church which has a large and thriving youth group for our children to participate and be a part of. This move was a move of faith and as a result we have experienced a blessing more than we could imagine! Our children are thriving, making new connections, great friends and good choices! We are extremely thankful and blessed! With this leap of faith, we were also blessed in another wonderful way! We were blessed in finding Lini Reading of Whitefish, MT who is one of our devoted Montana Mist Pick of the Litter Parents! Lini joined our Montana Mist family in 2013 and had offered several times that she would love to be a part of our program in helping with the breeding, whelping and raising of our beautiful puppies. I admit, I was skeptical at first! I knew Lini had a vast amount of experience as she had bred and raised her own golden retrievers in the past, but understood it had to be a very special person to run this very important part of our program! As I got to know Lini over this 2 year period, it became more than obvious that Lini definitely mirrored our passion, devotion, honesty and desire to provide the exact same quality and standard we have always set forth in our program! In August, 2015 we decided to let Lini do a "pilot litter" and allowed her to whelp and deliver Miss Izya's litter of 7 beautiful puppies. We were not disappointed and were absolutely blown away by the quality of work and blessing Lini provided in working with this litter. She out performed on every level and raised these pups with the same devotion, care and love that we have always provided. 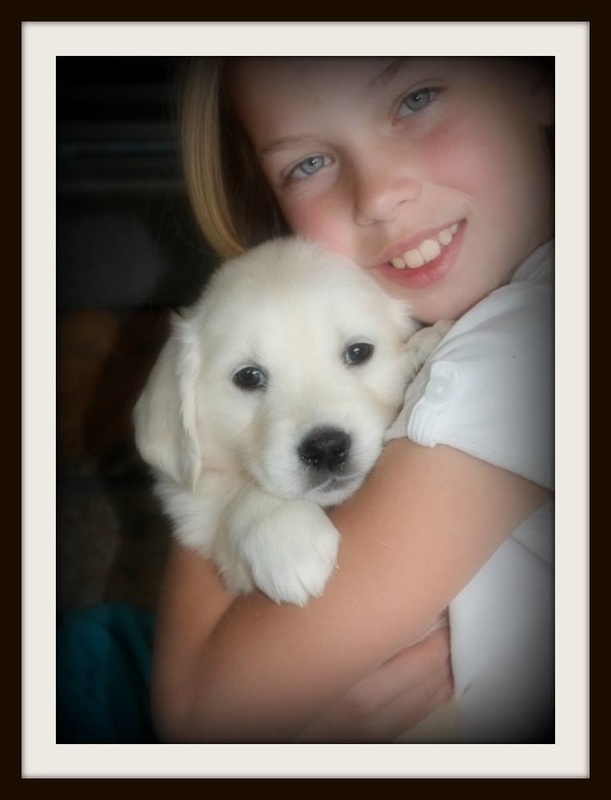 Click Here to see what our puppy parents have to say about Lini and Montana Mist Goldens! 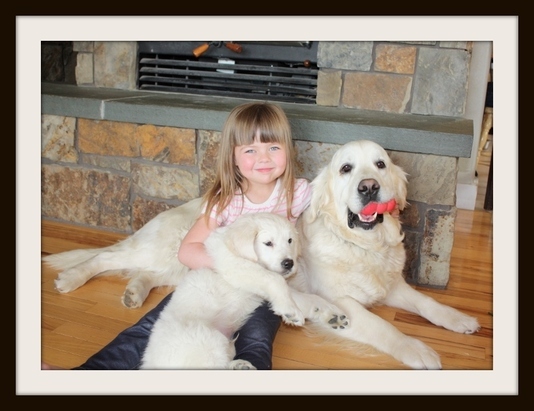 In August 2016, Oregon Mist Goldens officially came into being as a result of our move to Keizer, Oregon AND the increased demand for our beautiful English Cream Golden pups. We love what we do and look forward to the future! As a small hobby breeder of English Cream Golden Retrievers, our goal is to breed puppies that are of sound health, excellent temperament,and in keeping with the AKC standards of the breed. Our puppies are born and raised in our home with constant supervision and care. They are played with and socialized daily in preparing them to be excellent family pets. From the very beginning our goal has been a total commitment to improving the quality of the English Cream Golden Retriever breed. 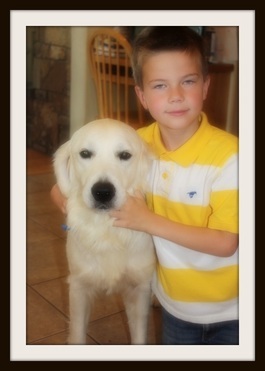 We provide nothing less than the best in EVERYTHING we do for our Goldens Family here at Montana Mist Goldens! We start by the choosing Sires and Dams from only the finest English Champion Bloodlines that are healthy, exquisite, and have calm, mellow temperaments. Next we spare no expenses when it comes to top quality nutrition and veterinarian care. We feed only the best and have chosen Life's Abundance because we honestly have not found a better nutrition program for our dogs! 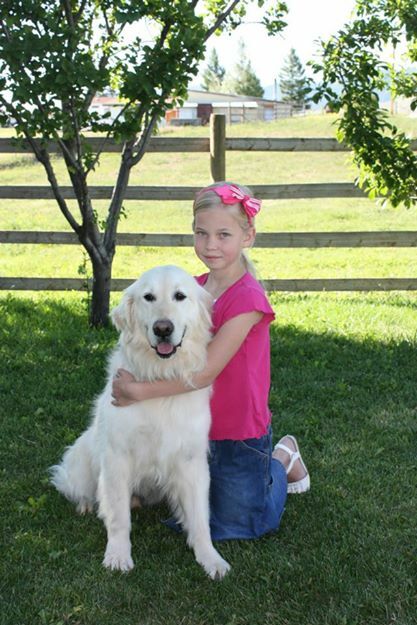 We are so convinced that with the solid nutrition Life's Abundance provides, our pets will live long and happy lives! Click here to learn more about Life's Abundance and how it can improve your pets life and your life!!! Just one of the precious, beautiful puppies! Gracie just loves our Montana Mist girls and boys! Abigail with our handsome Troy boy! Eric loving on one of our sweet pups!